Herbs that release the exterior. Herbs that clear heat. Herbs that drain downwards. Herbs that expel Wind-Dampness. Herbs that transform dampness. Aromatic substances that transform dampness; aromatic substances for external application; aromatic herbs that open the orifices. Herbs that transform phlegm. Herbs that relieve food stagnation; herbs that expel parasites; herbs that induce vomiting. Herbs that regulate the Qi. Herbs that regulate the blood. Herbs that stop bleeding. Herbs that warm the interior. Herbs that tonify. Astringent herbs. Substances that sedate the spirit and calm the mind. Herbs that sedate the Liver-yang and extinguish the Liver-wind. Appendix. Pinyin-English cross reference of herb names. Bibliography. 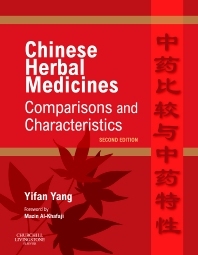 Yifan Yang studied traditional and modern medicine from 1977 to 1982 at Beijing University of Traditional Chinese Medicine and, after graduation, worked there as a teacher and doctor in the Chinese Herbal Formulas Department. Besides teaching and practicing, she completed her Masters degree in Chinese Herbal Medicines and Formulas. In 1990, she moved to the Netherlands and now works there as a Practitioner in Traditional Chinese Medicine in a TCM clinic. She has also lectures on traditional Chinese herbal medicine to doctors and physiotherapists in both the Netherlands, Germany, Belgium and Switzerland.